How often has a home’s interior made you feel delighted? calm? exhilarated? happy? Your home’s interior spaces reflect who you are and it often takes some real innovative thinking to bring out your own style. The world of color and home decorating is a vast one. The following can help you in your quest to innovate and decorate by providing you with the basics in color and color combinations. Take a look, make your spaces your own, go all out – remember to innovate and decorate! Whether you’re sprucing up the dining room for the holidays or preparing the nursery for that new addition, most decorating projects start with a particular location or a special occasion in mind. Having identified the space, the next step is to identify a source of inspiration upon which to build your palette. What inspires you could be as close as the cushion on your couch or as far away as your last vacation destination. Inspiration also comes from fashion, nature and art. Assemble items that appeal to you, whether they are fabric swatches, paint chips or photos cut from a magazine. They are your starting points. Take a good look at these items and notice just what colors attract and hold your attention. Chances are those are the same colors that you find in the personal palette of your wardrobe. Are you drawn to the warm hues of reds and yellows? Or do you find blues and greens feel better to you? If your worried about missing the latest “trend” just remember what fashion designer Yves St. Laurent once said, “Fashion fades, style is eternal.” Don’t forget, it’s your space; you have to feel comfortable in it. One final thought…you can take it with you! When shopping for paint, remember to bring your cushions, fabrics, wall or floor covering samples with you. While you’re in the paint store, use the take home chips in the display to locate your accessory colors as well. Assemble a collection of paint chips that best represent the color found in your decor. Create your own mini-fandeck comprised of your personal color palette and take it with you every time you shop for your home decorating needs. Remember to consider the influence that lighting in the store (flourescent = cool) has on your perceptions. And remember that the lighting in your home may make a difference as well. Direct sunlight exposes the colors in a room, showing their “natural form, without any additional warmth or coolness. Indirect sunlight tends to make colors appear warmer than they are. Artificial light can cause colors to appear warm or cool. Incandescent and halogen lights induce a warm look, while fluorescent lights create a cool look. Most light is typically artificial and the color of the light can vary. For example, warm lights from incandescent bulbs can intensify yellow and reds colors, while dulling cool colors. The cool blue light of fluorescent bulbs tend to muddy warm yellows and reds, but amplify colors like blue and green. Halogen bulbs produces a much whiter and brighter light. The most pure form of light, nautral light, will have a major influence on your color choice. Rooms with less direct sunlight tend to be cool. Warm light is more common for south facing rooms. Color can help balance the feeling of temperature in a room; use warm colors in north facing rooms and cool colors in south facing rooms. It’s very important when choosing color that you look at it in all different light scenarios. Color expert Kate Smith from Sensational Color knows what it takes to decide which color will be right for you. Follow these expert tips so you don’t regret your color choice. Light in a room changes many times throughout the day. From the natural light of early dawn to the artificial light of nightfall, the interplay of light and color is a crucial component when it comes to choosing your perfect paint colors. 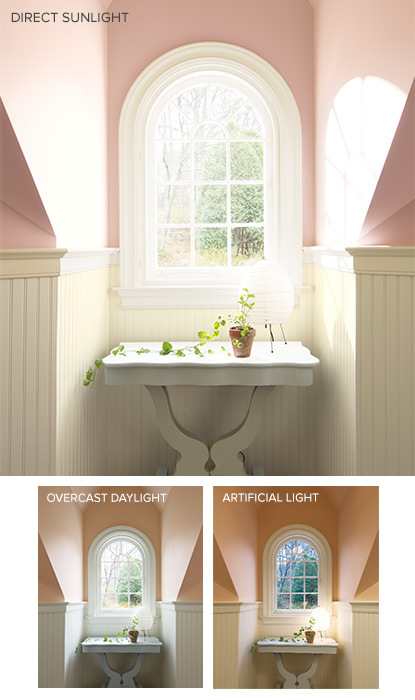 As seen here, bright midday sun will wash out most pale hues (top); that same hue will be flattered by softer, indirect illumination (lower left), while artificial light will add a warm glow to the wall color (lower right).